The healthcare market has never been more active, evolutionary, or ripe for disruption. In other words, it’s the perfect atmosphere for innovators who are looking for insights on market direction and a head start on trends that can help define their organization as thought-leaders in the industry. We understand that knowing your market = growing your business. 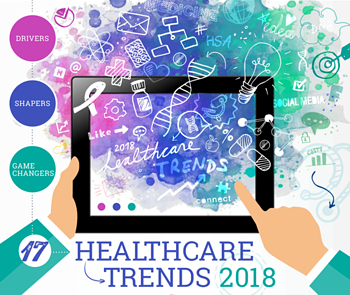 That’s why we’ve analyzed the top Drivers, Shapers, and Game Changers in healthcare for 2018 and compiled them into this easy to read infographic. Shapers: A rundown of disruptors currently affecting the shape of healthcare for 2018 and beyond. Download the full 2018 Healthcare Trends infographic and get a glimpse into the future of healthcare.